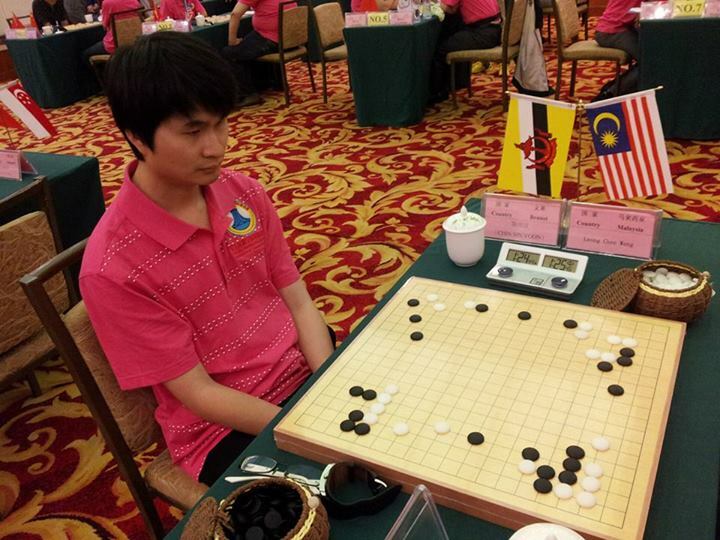 Finally, the result for Xinwen as the representative player of Brunei Darussalam Go Association is 19th place out of 32nd and again it is the best result for Brunei Team. 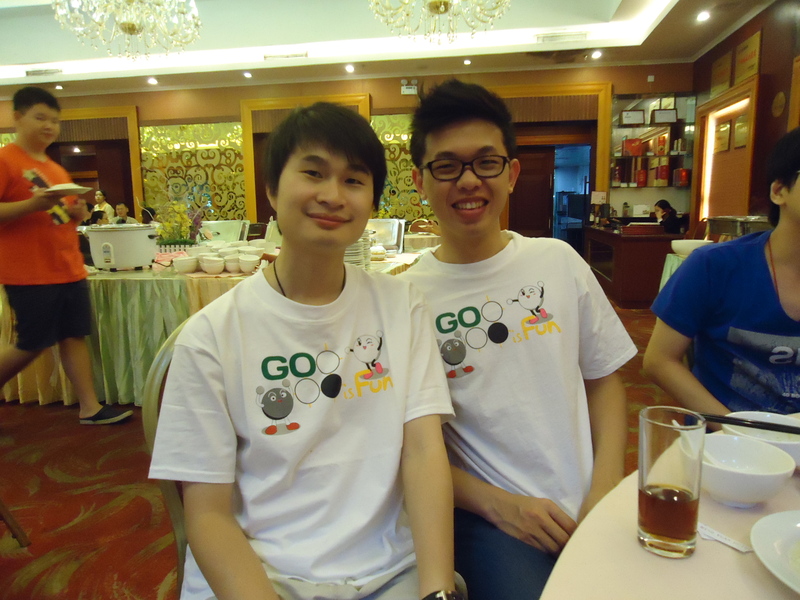 One of Xinwen’s weakness was to play against someone he knew, especially friend. 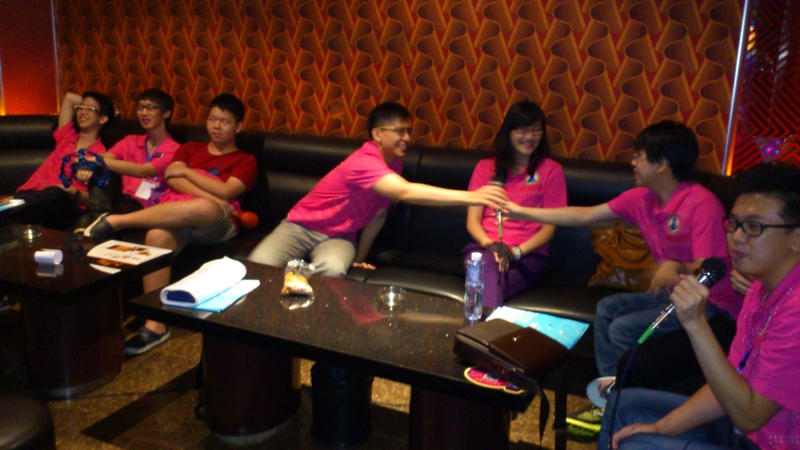 This game was definitely not Xinwen’s favourite, and the only game he had resigned. 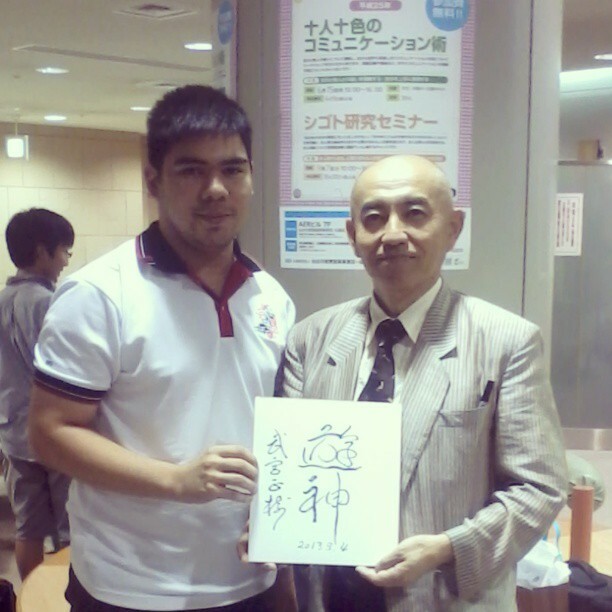 Neverthless, 4th day was the last day for the tournament which was the 11th of September, 2013. 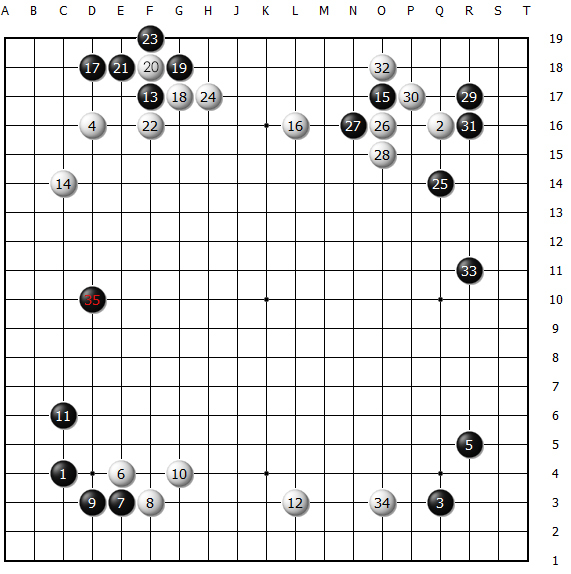 Diagram 1 (move 1 ~ 35), Xinwen who always thought highly in his fuseki until this game meeting James (Black); who controlled the speed very well. Especially the decision to make move 19 and move 25. 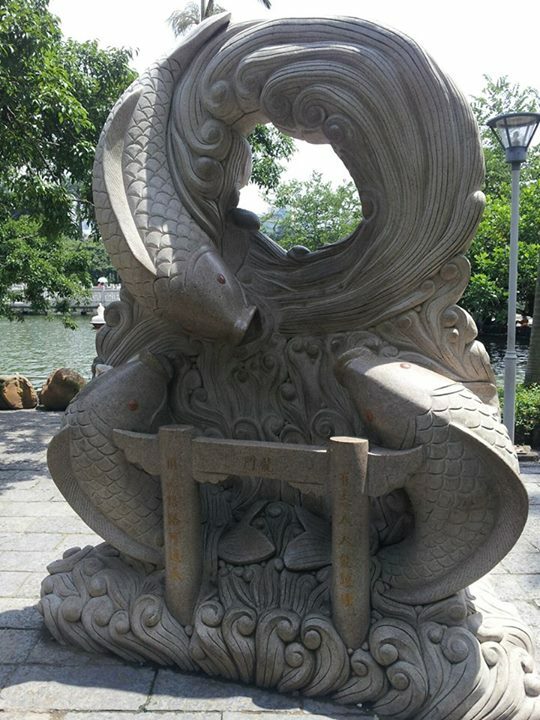 White had not possession of sente. 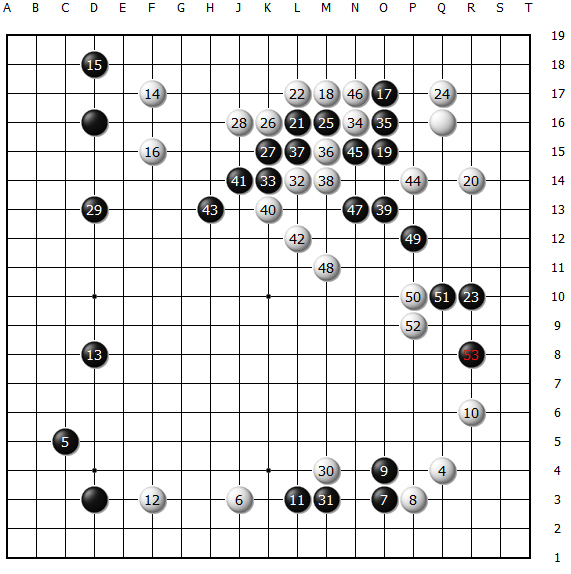 Diagram 2 (move 9 ~ 58), Xinwen made the invasion at move 36 but ended up in a gote which worsen the situation because Black took move 43; immediately prompted Xinwen aggression to destroy the left but it turn out disastrous. 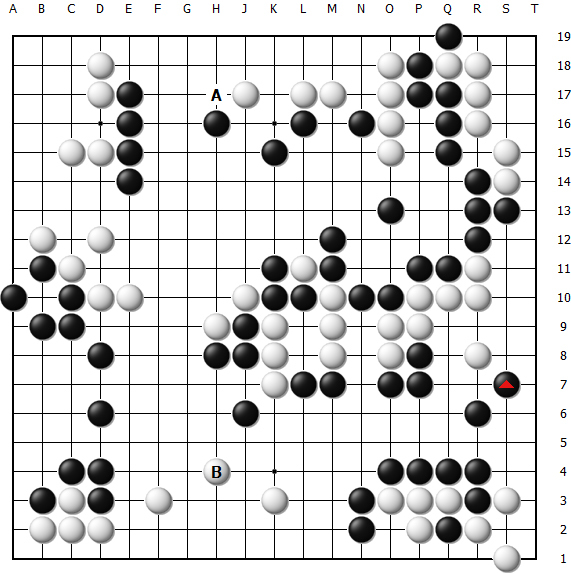 Not giving up, the game turned into moyo against territory which was a big chance for Xinwen especially when Black initiated the Ko plays at A then B. Last but not least, the final round against another familiar guy, Wynes Leong from Malaysia who always had high expectation from everyone. 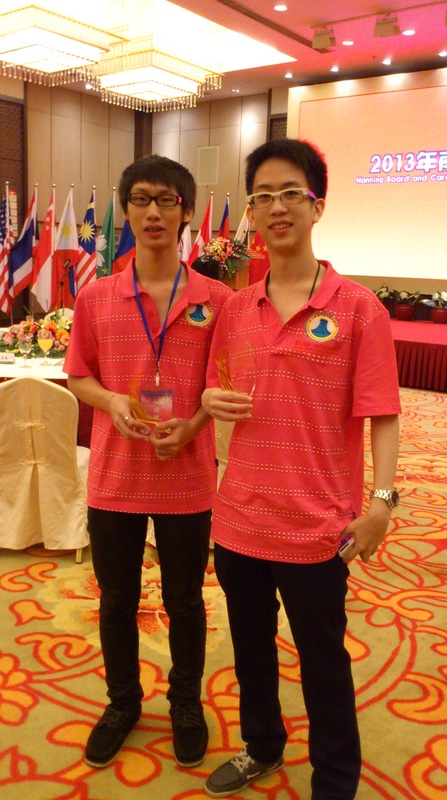 Wynes is also Weiqi Teacher for Malaysia Weiqi Association. Regardless, he is known for his aggression in style. 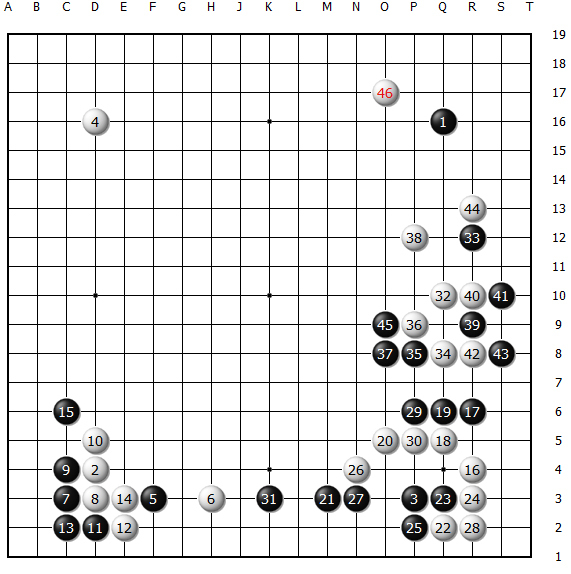 Diagram 1 (move 1 ~ 56), Xinwen uses Black and his most confident fuseki, everything was set nicely until Wynes made a aggressive cut at move 56. The game actually went on smoothly with few weird fancy moves by Wynes; nevertheless, the game was evenly matched until Xinwen fell behind in yose and resulted 180 for black. 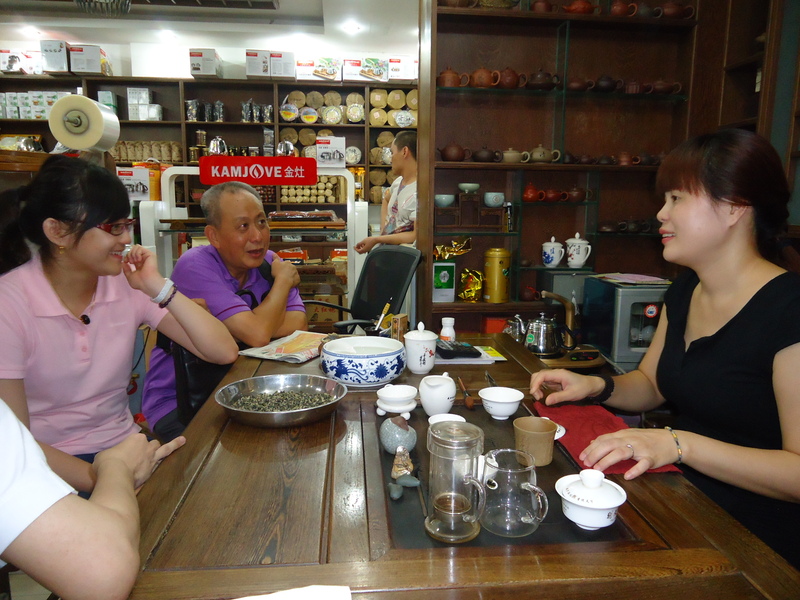 Xinwen did not know Guangxi has a whole street of Tea Retailing Shop, the gang ranges from Thailand, Singapore and Indonesia had a tea hunting night tasting the tea leaves and buying tea sets. 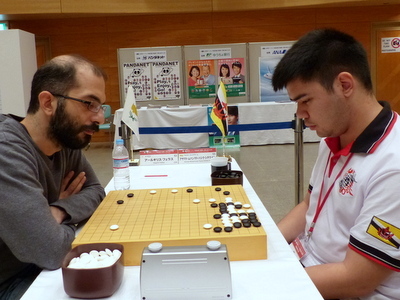 The game was very well executed by Xinwen (Black) during the fuseki until the KO fight began. 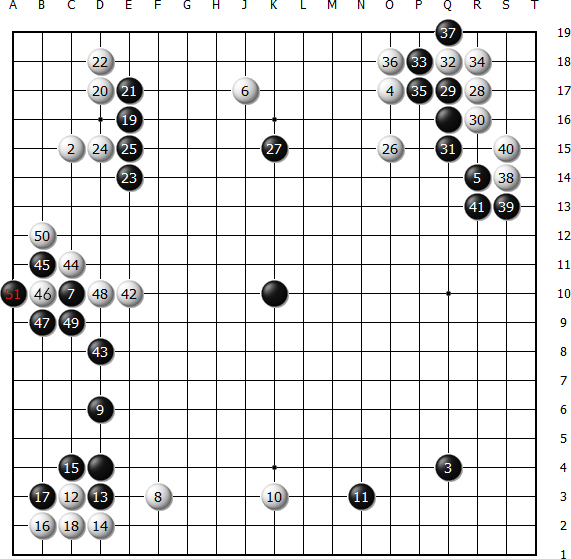 However it was yet to cost the game with the KO fight before the decision to kill the White’s group started. 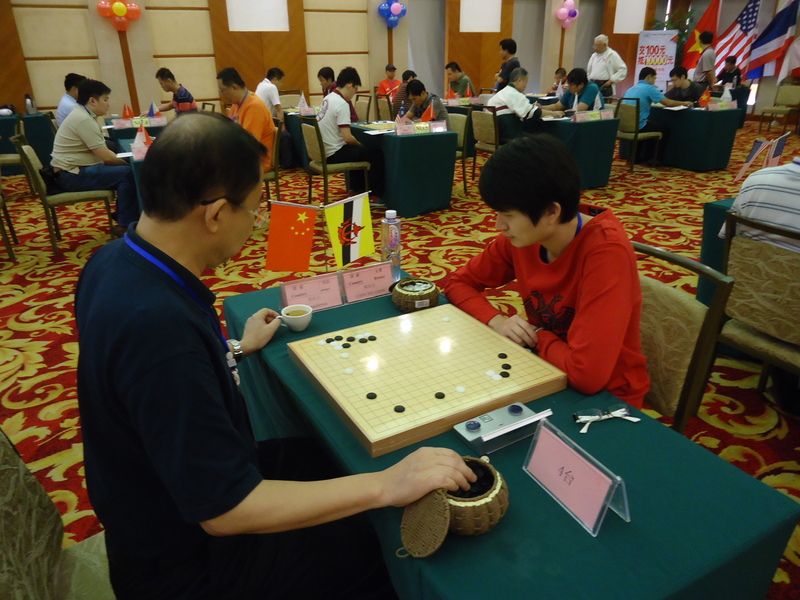 Diagram 1 (move 1 ~ 46), This game was one of the most favourited game by Xinwen in this whole tournament (even though he loses the game). 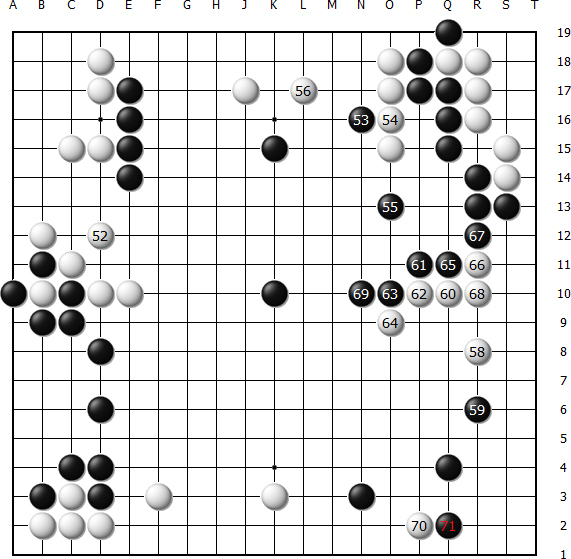 White made a mistake with his joseki move 22, gave him a gote resulted Black to move 19. The real test began when White kakari at move 46. 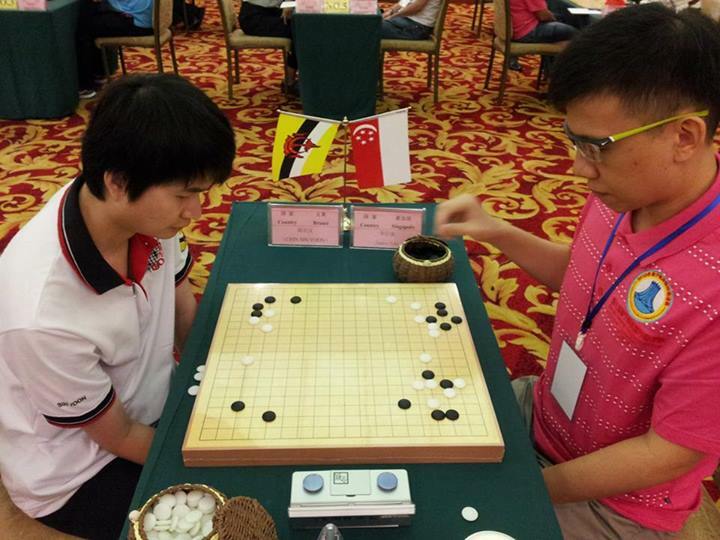 In the afternoon, Xinwen had made a victory against another Guangxi Representative player, Feng GuangLi (冯广立), which sealed the 3rd wins for Xinwen and it was also Brunei Records for winning the first 3-wins. Diagram 1 (move 1 ~ 28), Black (Xinwen) made his favourite fuseki, White later chose a interesting joseki move 12 to move 14 making his komoku into the hoshi-pincer joseki. 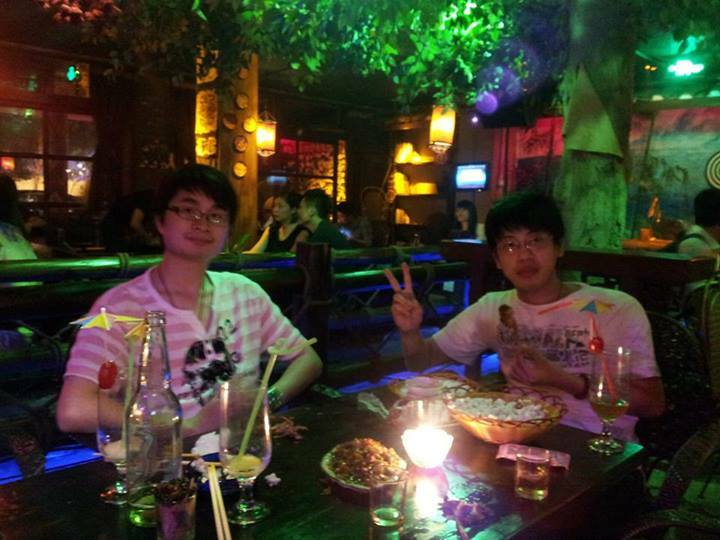 Followed by his move 20 which was very clear that he demanded moyo, for that reason Xinwen chose to sacrifice move 7 to create influence for himself. 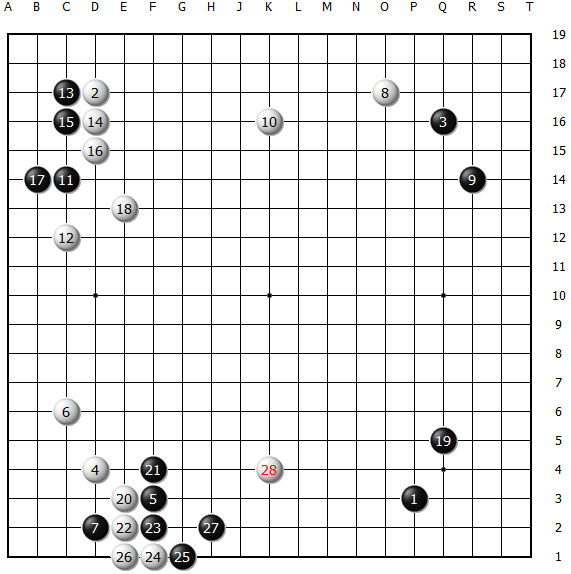 move 28 was aggressive by the White. 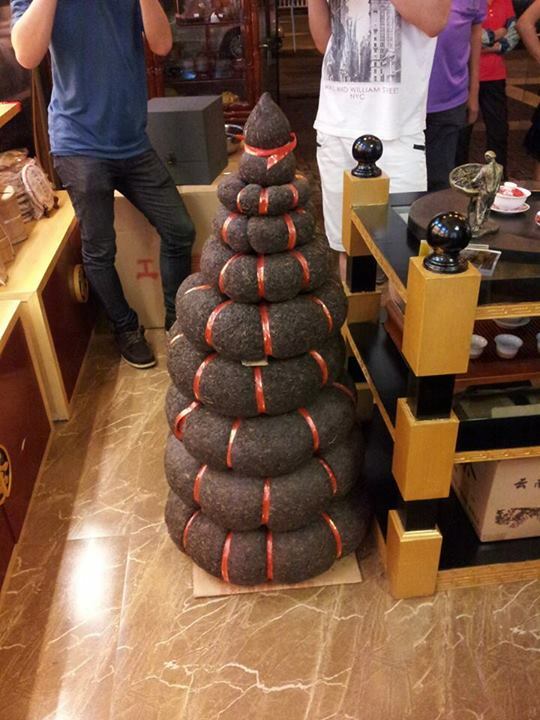 Due to the budget constraint, Xinwen had noticed that the host Organisation such as the Guangxi Weiqi Association and even Korea Amateur Baduk Association had cut budget from tour. 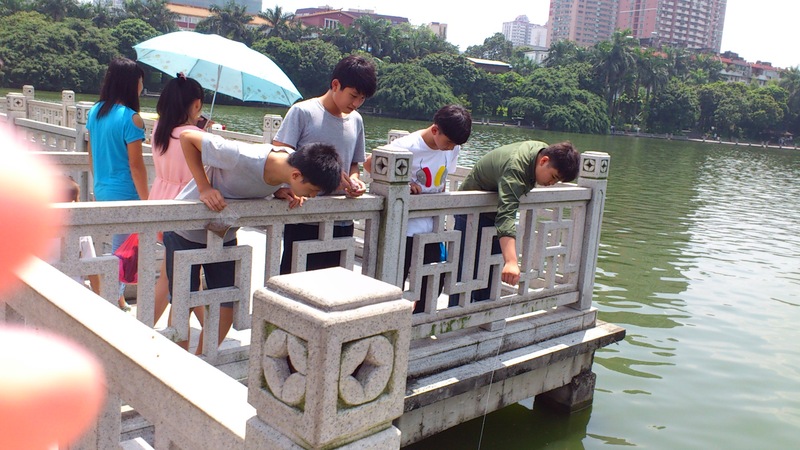 Regardless, Xinwen and the gang visited the nearest Park 人民公园 from our Hotel 明园新都饭店, which was the same hotel Xinwen had stayed in the year 2010 at different block. 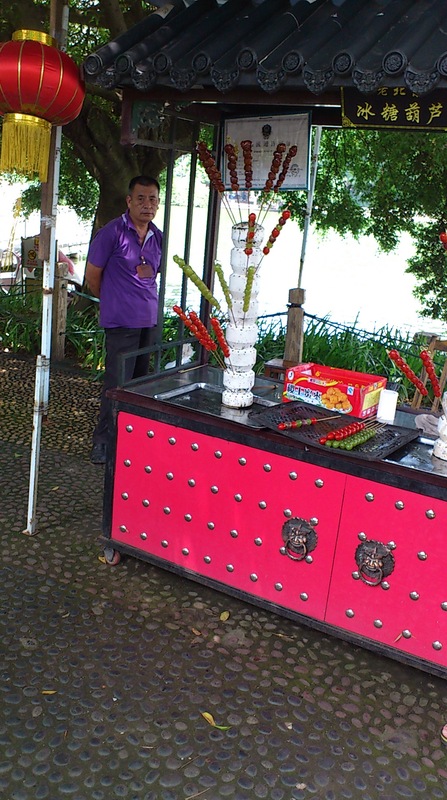 To compliment, the food for buffet is much better than Xinwen previous stays. 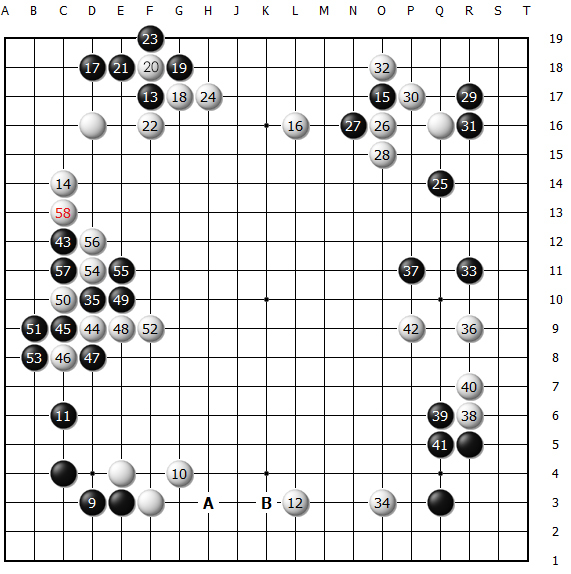 Diagram 1 (move 1 ~ 42), Xinwen is white in this game, the Black made some questionable moves to answer the joseki which isn’t the same as usual Variation (shown above); however the Black’s intention is quite clear. 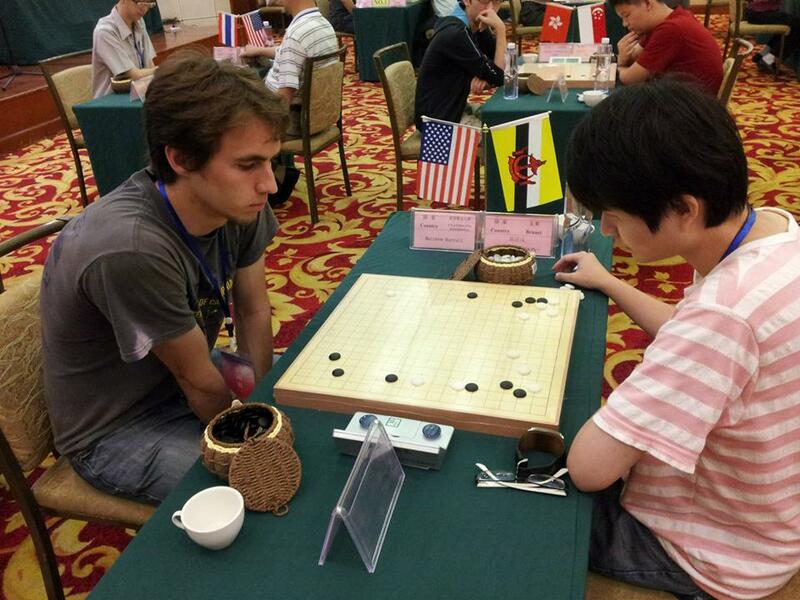 In the end White killed the whole group on the right which granted Xinwen the second win right away on the second round! Diagram 1 (move 1 ~ 42), the starting was very simple until the Matthew (Black) made an invasion with move 27 and sacrificing move 33 and move 31. 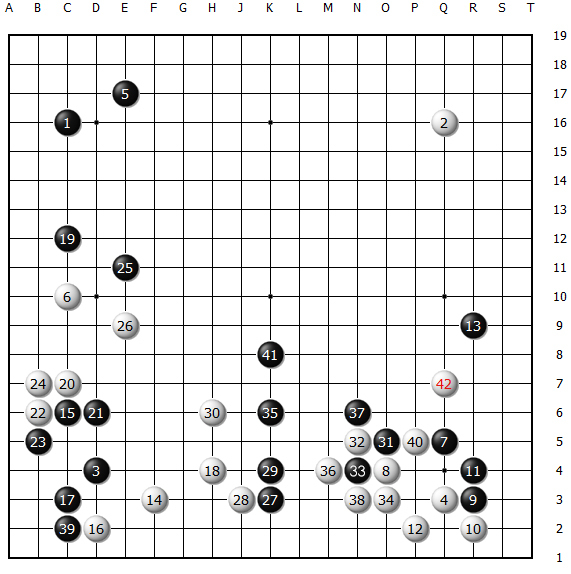 Black’s move 39 was very remarkable to witness his unique style of tenuki and settling shapes! 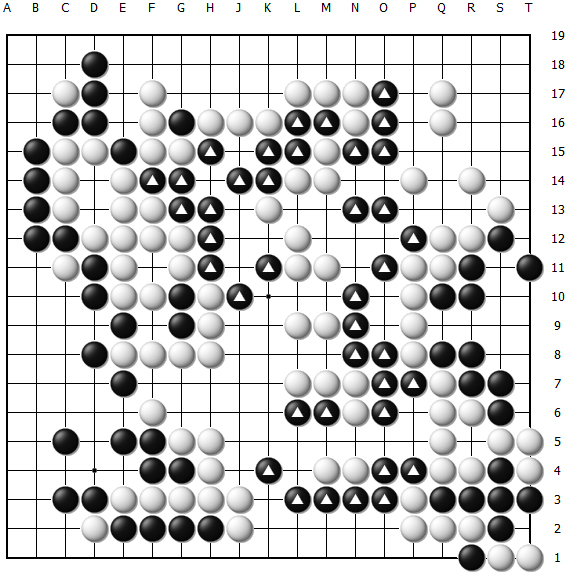 Diagram 2 (move 26 ~ 75), Nevertheless the game continues until the Black made another unique trade at move 71 with Xinwen’s move 72. 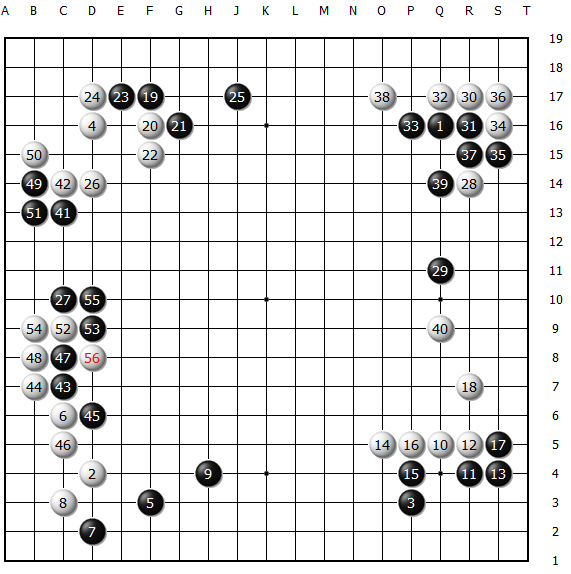 At this point, Xinwen accidentally fell into Black’s footsteps. With bad judgment, move 74 was bad to allow invasion move 75, it was the first deciding move. 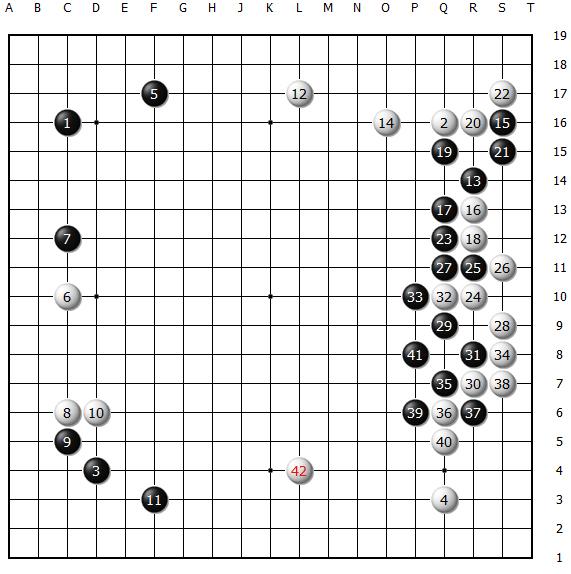 The game eventually went to a KO fight and a mistake Ko-Threat by Xinwen had cost this game to turnover Black’s side. 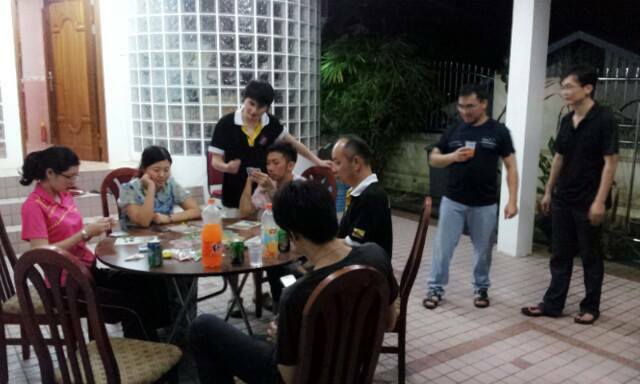 The tournament was commenced from the 6th September to the 12th September, but Brunei Team (Xinwen and ChaiHui) took a transit on the 5th September in Kuala Lumpur and stayed overnight at HockDoong‘s house. 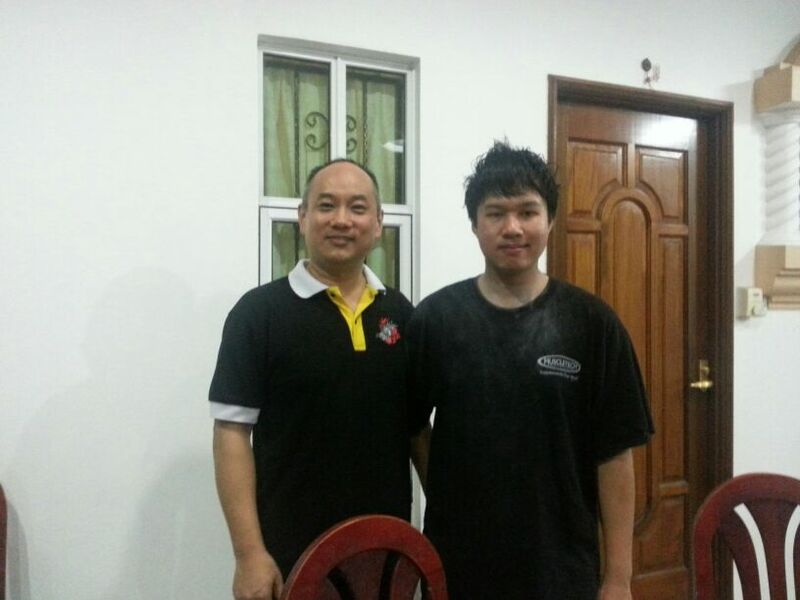 Regretfully, Brunei’s player KaoXiang was unable to go on boarding with the team. The immigration had became strict with any damage to your passport especially the profile page of the holder; if there was a sign of peeling off from its protective layer, the custom will have to reject your passport and demand renewal of your passport. Nevertheless, thanks to KaiChen, PhilipCher and Jimmy for all the hospitality. 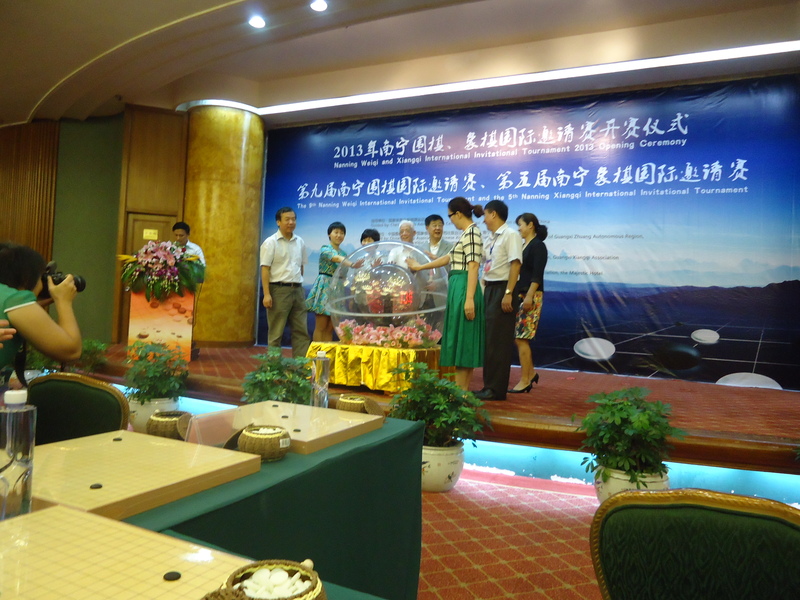 Opening Ceremony speeches were conducted by Admin-Manager of State-General Administration of Sports, Liu Shi Ming (刘思明) who is also the current President of Chinese Weiqi Association being said. 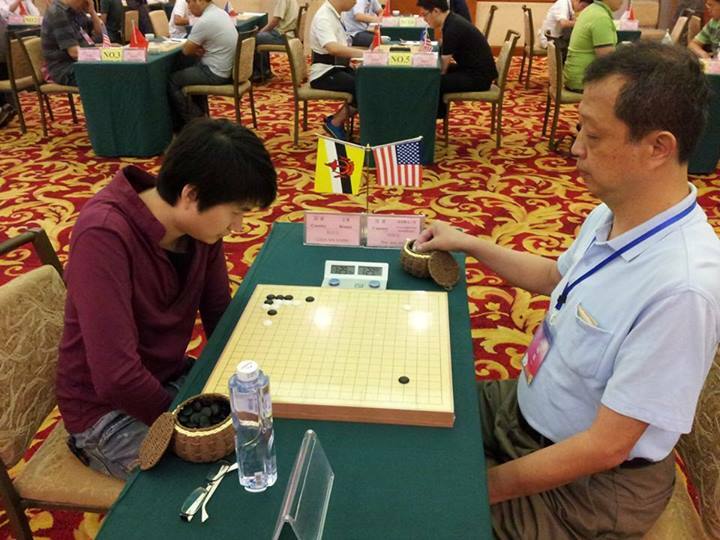 On the same day, professional 7-dan female champion, Hua Xue Ming (华学明) played simultaneous games with the representative players. 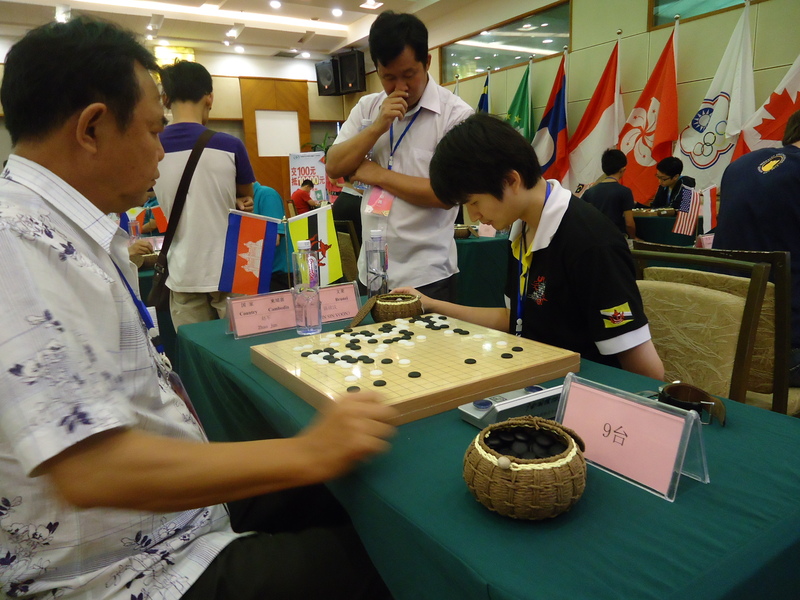 While the other female professional player 3-dan, Chao YouYi (曹又尹) played with the other representatives players. 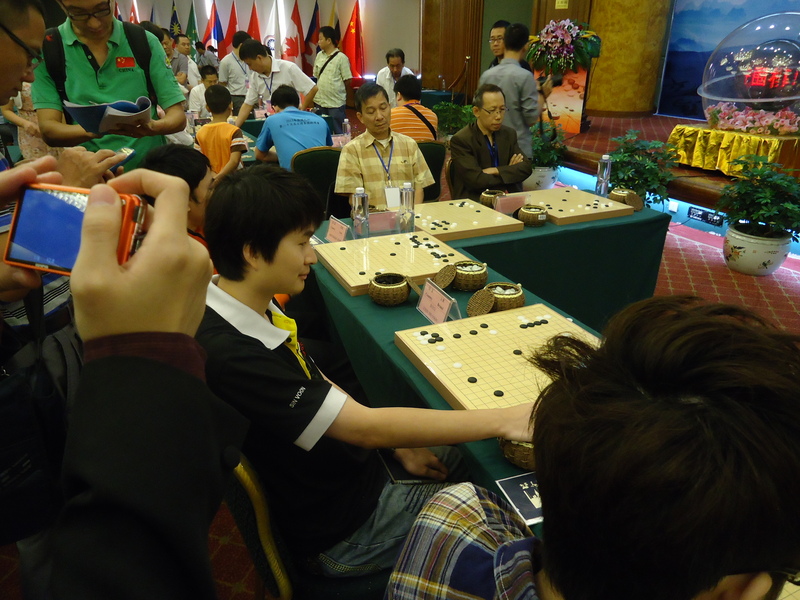 The rest had the opportunity to play against the local young go players (shown on the pictures). 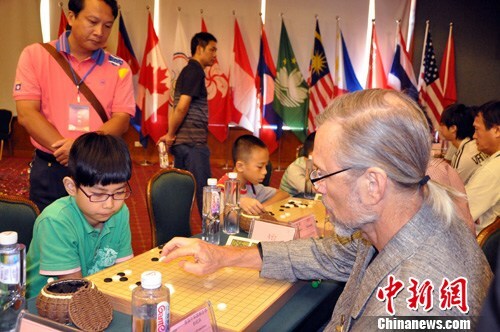 The event is in conjunction with the 5th Guangxi Chinese Chess International Tournament as well where players from all over the world came to compete. This Year, countries that participated in this event are: Brunei, Cambodia, Malaysia, Singapore, Thailand, Vietnam,Indonesia, Laos, the Philippines, Macao, Hong Kong, Taipei, USA Los Angeles and USA San Fransico. 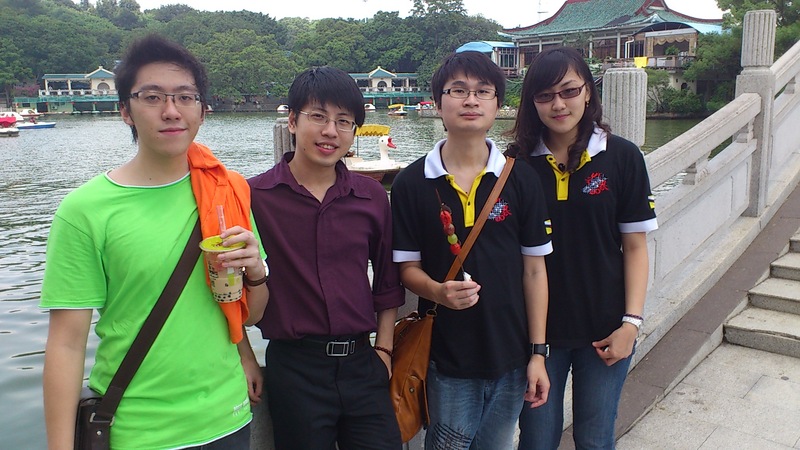 Nevertheless, there are many familiar faces from Vietnam Le May Duy, Malaysia’s Wynes Leong, Macao players and so on. 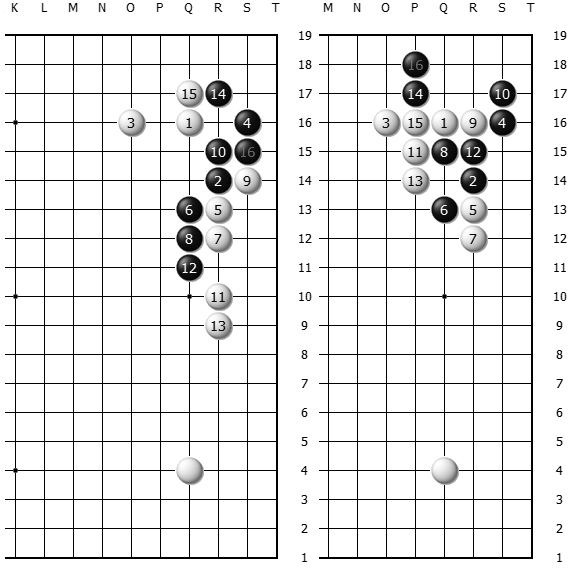 Diagram 3 (Critical Point), Xinwen had however did not find the chance to play A and/or B which cost this game; it was fun game overall. 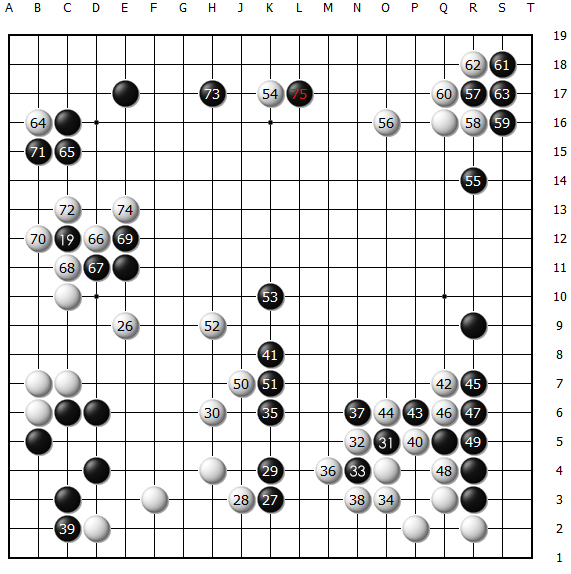 Diagram 1 (1~50), The opponent made a weird joseki and prompted Xinwen to move 32 ~ 36 to break free; however the game did not actually go easy from that point. However it was lucky to trap the two groups dead in the Result in Game 1. 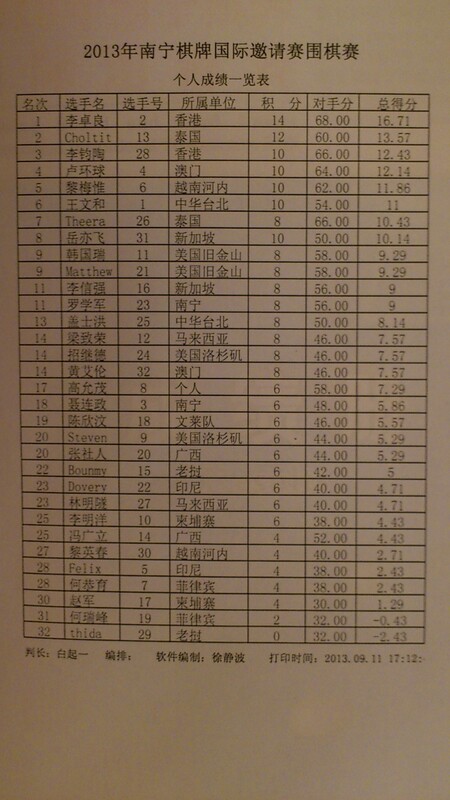 Thus Xinwen snatched the first win in the afternoon of Day 1. 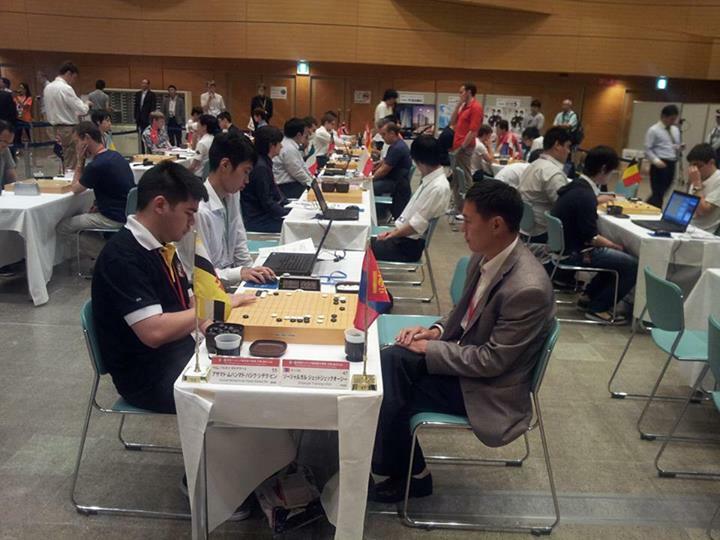 The 34th World Amateur Go Championship was commencing from the 31st August to the 5th September, 2013 in Sendai, Japan. 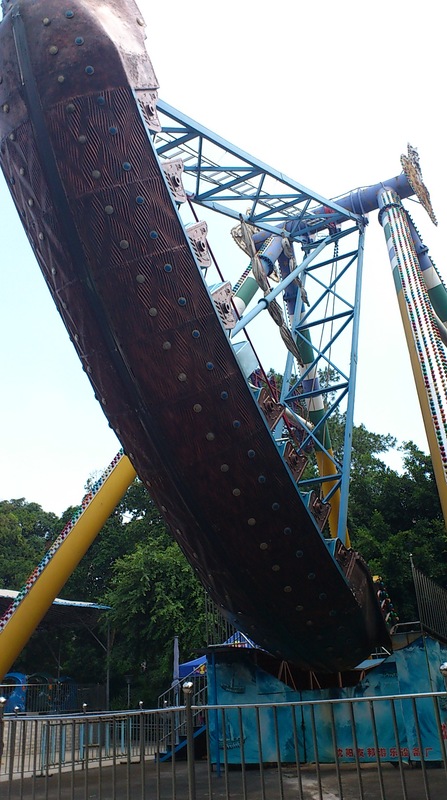 Nevertheless, this was the first time Brunei Darussalam Go Association sent a representative to Japan for this World-Class Tournament, and Sid Miller had also made his debut in this event. 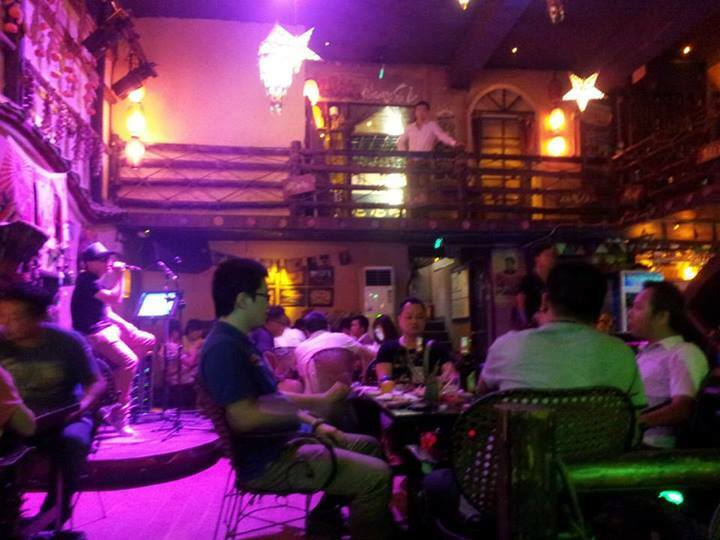 Regardless, there were many known players from other countries such as Hu YuQing from China, Tan JiaCheng from Singapore, Suzzane from Malaysia, Ondrej Silt from Czeh, Ngoc Cuong Nguyen from Luxembourg, Sebastian Mualim from Indonesia and Mario Miguel Aguero Obando from Costa Rica and many more! 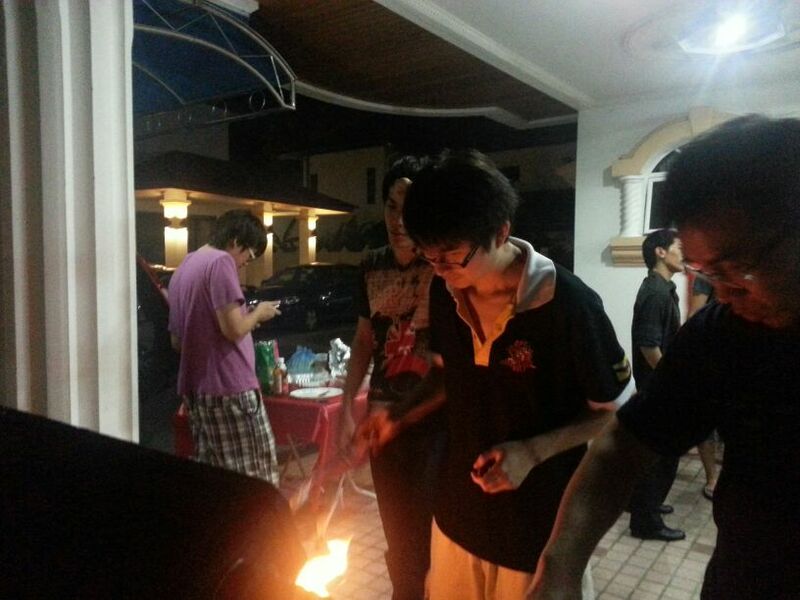 [31st August, 2013] Its been a while to celebrate with the members of the Association; even though not all of them could attend but the Barbecue Night was considerably delightful. 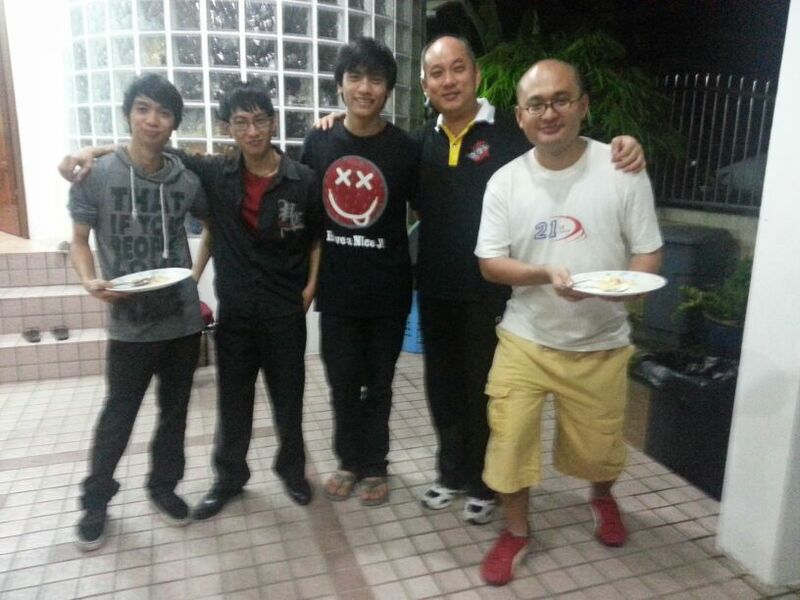 Javian Tay was the generous host and while the others brought food to grill.